Despite the fact that Twitter has been slowly building up its advertising offerings, and is making money from them, advertising on the popular microblogging service is still far more difficult to come by than, say, Facebook. That’s because Twitter’s ad offerings, which include Promoted Tweets and Trends, are fairly unobtrusive. For users, that’s a good thing. Twitter, however, has a dilemma: if its ads are too unobtrusive and many users don’t even notice them, they’re not going to be effective for advertisers who are shelling out big bucks to advertise on one of the internet’s most prominent social media properties. At the same time, if Twitter makes advertising more intrusive, it risks sparking the ire of users who have become accustomed to a nearly ad-free experience. Given that Twitter is a business, and investors continue to bet big on its prospects for financial success, it probably shouldn’t come as a surprise that the company is reportedly preparing to take some risk in an effort to bolster its advertising business model. “Promoted Tweets To Followers” are supposed to help solve that problem in two ways. They allow brands to send messages directly to people who have already said they care about them — that is, Starbucks can target people who are already following Starbucks on Twitter. And they can ensure that Starbucks’ followers actually see the ad, by inserting them at the top of their timelines. The good news for Twitter users is that Promoted Tweets to Followers won’t stay at the top of their timelines; they’ll inch their way down tweet-by-tweet after the initial impression. The million-dollar question, of course, is how far Twitter can push timeline-based advertising before users object. Here, it may be jeopardizing brands’ relationships with their followers. After all, if following a brand on Twitter effectively opts users into advertising programs that allow those brands to hit their followers with more aggressive messaging, it might discourage some users from following brands. Brands, of course, should consider this. They should also consider that they already have the ability to ‘advertise‘ to their followers free of charge. Yes, Promoted Tweets to Followers makes it easy to highlight a particular message, but the reality is that more than a few brands have run very successful Twitter campaigns without Twitter’s help. The key: the campaigns had a message that mattered to recipients. As such, they not only responded to it, but in many cases redistributed it to their followers. At the end of the day, whether brands employ Promoted Tweets for Followers or not, they should remember that having a message that resonates is just as important to action and viral distribution as having a message that’s simply seen. While many publishers in the West struggle to build profitable paywalls, I recently reported that a paywall in the East may provide a blueprint for success. That paywall was erected in Slovakia by a company called Piano Media. It brought together nine of Slovakia’s largest news publishers, and the early results are impressive given the size and characteristics of the Slovakian market. Twice a year Econsultancy produces a print magazine focused on multichannel business strategies, to help support our JUMP event. The latest issue of the JUMP magazine is now available for download. It’s free, though you need to be a registered Bronze member (also free) or Econsultancy subscriber to download it. In it you’ll find that we’ve been exploring the relationship between TV and online, among other things. We’re slightly obsessed with the idea that we are on the verge of another golden age for television. From a follow up survey of attendees to Econsultancy’s Digital Cream event in March, one common theme was that companies, specifically brands, are struggling to find the right talent for the right roles. 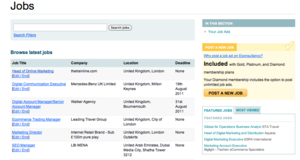 Having just read the post on the launch of Adzuna, a social search engine which aggregates job ads from a range of sources, I got thinking about the role of job boards within digital marketing and e-commerce, and how they could be improved to make life easier for employers, recruiters and candidates.